"ECG" and "EKG" redirect here. For other uses, see ECG (disambiguation) and EKG (disambiguation). Not to be confused with other types of electrography or with echocardiography. Electrocardiography is the process of producing an electrocardiogram (ECG or EKG[a]), a recording - a graph of voltage versus time - of the electrical activity of the heart using electrodes placed on the skin. These electrodes detect the small electrical changes that are a consequence of cardiac muscle depolarization followed by repolarization during each cardiac cycle (heartbeat). Changes in the normal ECG pattern occur in numerous cardiac abnormalities, including cardiac rhythm disturbances (such as atrial fibrillation and ventricular tachycardia), inadequate coronary artery blood flow (such as myocardial ischemia and myocardial infarction), and electrolyte disturbances (such as hypokalemia and hyperkalemia). In a conventional 12-lead ECG, ten electrodes are placed on the patient's limbs and on the surface of the chest. The overall magnitude of the heart's electrical potential is then measured from twelve different angles ("leads") and is recorded over a period of time (usually ten seconds). 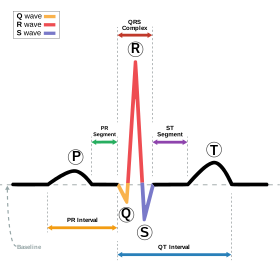 In this way, the overall magnitude and direction of the heart's electrical depolarization is captured at each moment throughout the cardiac cycle. There are three main components to an ECG: the P wave, which represents the depolarization of the atria; the QRS complex, which represents the depolarization of the ventricles; and the T wave, which represents the repolarization of the ventricles. During each heartbeat, a healthy heart has an orderly progression of depolarization that starts with pacemaker cells in the sinoatrial node, spreads throughout the atrium, passes through the atrioventricular node down into the bundle of His and into the Purkinje fibers, spreading down and to the left throughout the ventricles. This orderly pattern of depolarization gives rise to the characteristic ECG tracing. To the trained clinician, an ECG conveys a large amount of information about the structure of the heart and the function of its electrical conduction system. Among other things, an ECG can be used to measure the rate and rhythm of heartbeats, the size and position of the heart chambers, the presence of any damage to the heart's muscle cells or conduction system, the effects of heart drugs, and the function of implanted pacemakers. Perioperative monitoring in which any form of anesthesia is involved (e.g. monitored anesthesia care, general anesthesia). This includes preoperative asessment, intraoperative and postoperative monitoring. Clinical cardiac electrophysiology in which a catheter is inserted through the femoral vein and can have several electrodes along its length to record the direction of electrical activity from within the heart. ECGs can be recorded as short intermittent tracings or continuous ECG monitoring. Continuous monitoring is used for critically ill patients, patients undergoing general anesthesia, and patients who have an infrequently occurring cardiac arrhythmia that would unlikely be seen on a conventional ten-second ECG. Continuous monitoring can be conducted by using Holter monitors, internal and external defibrillators and pacemakers, and/or biotelemetry. Evidence does not support the use of ECGs among those without symptoms or at low risk of cardiovascular disease as an effort for prevention. This is because an ECG may falsely indicate the existence of a problem, leading to misdiagnosis, the recommendation of invasive procedures, or overtreatment. However, persons employed in certain critical occupations, such as aircraft pilots, may be required to have an ECG as part of their routine health evaluations. Hypertrophic cardiomyopathy screening may also be considered in adolescents as part of a sports physical out of concern for sudden cardiac death (varies by country). Electrocardiographs are recorded by machines that consist of a set of electrodes connected to a central unit. Early ECG machines were constructed with analog electronics where the signal drove a motor to print out the signal onto paper. Today, electrocardiographs use analog-to-digital converters to convert the electrical activity of the heart to a digital signal. Many ECG machines are now portable and commonly include a screen, keyboard, and printer on a small wheeled cart. Recent advancements in electrocardiography include developing even smaller devices for inclusion in fitness trackers and smart watches. These smaller devices often rely on only two electrodes to deliver a single lead. Defibrillation protection: any ECG used in healthcare may be attached to a person who requires defibrillation and the ECG needs to protect itself from this source of energy. Electrostatic discharge is similar to defibrillation discharge and requires voltage protection up to 18,000 volts. Additionally circuitry called the right leg driver can be used to reduce common-mode interference (typically the 50 or 60 Hz mains power). ECG voltages measured across the body are very small. This low voltage necessitates a low noise circuit and instrumentation amplifiers. Simultaneous lead recordings: Earlier designs recorded each lead sequentially, but current models record multiple leads simultaneously. Most modern ECG machines include automated interpretation algorithms. This analysis calculates features such as the PR interval, QT interval, corrected QT (QTc) interval, PR axis, QRS axis, rhythm and more. The results from these automated algorithms are considered "preliminary" until verified and/or modified by expert interpretation. Despite recent advances, computer misinterpretation remains a significant problem and can result in clinical mismanagement. Proper placement of the limb electrodes. The limb electrodes can be far down on the limbs or close to the hips/shoulders as long as they are placed symmetrically. Electrodes are the actual conductive pads attached to the body surface. Any pair of electrodes can measure the electrical potential difference between the two corresponding locations of attachment. Such a pair forms a lead. However, "leads" can also be formed between a physical electrode and a virtual electrode, known as the Wilson's central terminal, whose potential is defined as the average potential measured by three limb electrodes that are attached to the right arm, the left arm, and the left foot, respectively. Commonly, 10 electrodes attached to the body are used to form 12 ECG leads, with each lead measuring a specific electrical potential difference (as listed in the table below). Leads are broken down into three types: limb; augmented limb; and precordial or chest. The 12-lead ECG has a total of three limb leads and three augmented limb leads arranged like spokes of a wheel in the coronal plane (vertical), and six precordial leads or chest leads that lie on the perpendicular transverse plane (horizontal). In medical settings, the term leads is also sometimes used to refer to the electrodes themselves, although this is technically incorrect. This misuse of terminology can be the source of confusion. The 10 electrodes in a 12-lead ECG are listed below. RA On the right arm, avoiding thick muscle. LA In the same location where RA was placed, but on the left arm. LL In the same location where RL was placed, but on the left leg. V1 In the fourth intercostal space (between ribs 4 and 5) just to the right of the sternum (breastbone). V2 In the fourth intercostal space (between ribs 4 and 5) just to the left of the sternum. V3 Between leads V2 and V4. 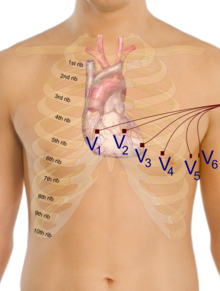 V4 In the fifth intercostal space (between ribs 5 and 6) in the mid-clavicular line. V5 Horizontally even with V4, in the left anterior axillary line. V6 Horizontally even with V4 and V5 in the mid-axillary line. Two types of electrodes in common use are a flat paper-thin sticker and a self-adhesive circular pad. The former are typically used in a single ECG recording while the latter are for continuous recordings as they stick longer. Each electrode consists of an electrically conductive electrolyte gel and a silver/silver chloride conductor. The gel typically contains potassium chloride – sometimes silver chloride as well – to permit electron conduction from the skin to the wire and to the electrocardiogram. In a 12-lead ECG, all leads except the limb leads are unipolar (aVR, aVL, aVF, V1, V2, V3, V4, V5, and V6). 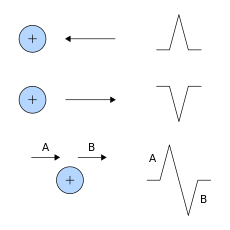 The measurement of a voltage requires two contacts and so, electrically, the unipolar leads are measured from the common lead (negative) and the unipolar lead (positive). This averaging for the common lead and the abstract unipolar lead concept makes for a more challenging understanding and is complicated by sloppy usage of "lead" and "electrode". Leads I, II and III are called the limb leads. The electrodes that form these signals are located on the limbs – one on each arm and one on the left leg. The limb leads form the points of what is known as Einthoven's triangle. Leads aVR, aVL, and aVF are the augmented limb leads. They are derived from the same three electrodes as leads I, II, and III, but they use Goldberger's central terminal as their negative pole. Goldberger's central terminal is a combination of inputs from two limb electrodes, with a different combination for each augmented lead. It is referred to immediately below as "the negative pole". Together with leads I, II, and III, augmented limb leads aVR, aVL, and aVF form the basis of the hexaxial reference system, which is used to calculate the heart's electrical axis in the frontal plane. The precordial leads lie in the transverse (horizontal) plane, perpendicular to the other six leads. The six precordial electrodes act as the positive poles for the six corresponding precordial leads: (V1, V2, V3, V4, V5 and V6). Wilson's central terminal is used as the negative pole. Additional electrodes may rarely be placed to generate other leads for specific diagnostic purposes. Right-sided precordial leads may be used to better study pathology of the right ventricle or for dextrocardia (and are denoted with an R (e.g., V5R). Posterior leads (V7 to V9) may be used to demonstrate the presence of a posterior myocardial infarction. A Lewis lead (requiring an electrode at the right sternal border in the second intercostal space) can be used to study pathological rhythms arising in the right atrium. An esophogeal lead can be inserted to a part of the esophagus where the distance to the posterior wall of the left atrium is only approximately 5–6 mm (remaining constant in people of different age and weight). An esophageal lead avails for a more accurate differentiation between certain cardiac arrhythmias, particularly atrial flutter, AV nodal reentrant tachycardia and orthodromic atrioventricular reentrant tachycardia. It can also evaluate the risk in people with Wolff-Parkinson-White syndrome, as well as terminate supraventricular tachycardia caused by re-entry. An intracardiac electrogram (ICEG) is essentially an ECG with some added intracardiac leads (that is, inside the heart). The standard ECG leads (external leads) are I, II, III, aVL, V1, and V6. Two to four intracardiac leads are added via cardiac catheterization. The word "electrogram" (EGM) without further specification usually means an intracardiac electrogram. A standard 12-lead ECG report (an electrocardiograph) shows a 2.5 second tracing of each of the twelve leads. The tracings are most commonly arranged in a grid of four columns and three rows. 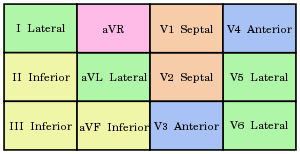 the first column is the limb leads (I, II, and III), the second column is the augmented limb leads (aVR, aVL, and aVF), and the last two columns are the precordial leads (V1 to V6). Additionally, a rhythm strip may be included as a fourth or fifth row. The timing across the page is continuous and not tracings of the 12 leads for the same time period. In other words, if the output were traced by needles on paper, each row would switch which leads as the paper is pulled under the needle. For example, the top row would first trace lead I, then switch to lead aVR, then switch to V1, and then switch to V4 and so none of these four tracings of the leads are from the same time period as they are traced in sequence through time. Each of the 12 ECG leads records the electrical activity of the heart from a different angle, and therefore align with different anatomical areas of the heart. Two leads that look at neighboring anatomical areas are said to be contiguous. In addition, any two precordial leads next to one another are considered to be contiguous. For example, though V4 is an anterior lead and V5 is a lateral lead, they are contiguous because they are next to one another. The study of the conduction system of the heart is called cardiac electrophysiology (EP). An EP study is performed via a right-sided cardiac catheterization: a wire with an electrode at its tip is inserted into the right heart chambers from a peripheral vein, and placed in various positions in close proximity to the conduction system so that the electrical activity of that system can be recorded. Interpretation of the ECG is fundamentally about understanding the electrical conduction system of the heart. Normal conduction starts and propagates in a predictable pattern, and deviation from this pattern can be a normal variation or be pathological. An ECG does not equate with mechanical pumping activity of the heart, for example, pulseless electrical activity produces an ECG that should pump blood but no pulses are felt (and constitutes a medical emergency and CPR should be performed). Ventricular fibrillation produces an ECG but is too dysfunctional to produce a life-sustaining cardiac output. Certain rhythms are known to have good cardiac output and some are known to have bad cardiac output. Ultimately, an echocardiogram or other anatomical imaging modality is useful in assessing the mechanical function of the heart. Like all medical tests, what constitutes "normal" is based on population studies. The heartrate range of between 60 and 100 beats per minute (bpm) is considered normal since data shows this to be the usual resting heart rate. Thus, the overall direction of depolarization and repolarization produces a vector that produces positive or negative deflection on the ECG depending on which lead it points to. For example, depolarizing from right to left would produce a positive deflection in lead I because the two vectors point in the same direction. In contrast, that same depolarization would produce minimal deflection in V1 and V2 because the vectors are perpendicular and this phenomenon is called isoelectric. 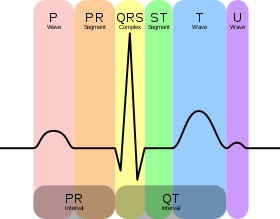 Normal rhythm produces four entities – a P wave, a QRS complex, a T wave, and a U wave – that each have a fairly unique pattern. The P wave represents atrial depolarization. The QRS complex represents ventricular depolarization. The T wave represents ventricular repolarization. The U wave represents papillary muscle repolarization. However, the U wave is not typically seen and its absence is generally ignored. Changes in the structure of the heart and its surroundings (including blood composition) change the patterns of these four entities. A small box is 1 mm × 1 mm and represents 0.1 mV × 0.04 seconds. 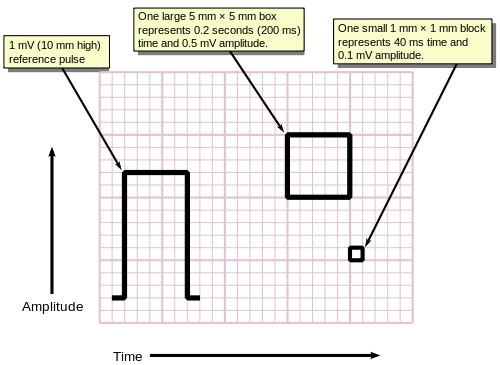 A large box is 5 mm × 5 mm and represents 0.5 mV × 0.20 seconds. The "large" box is represented by a heavier line weight than the small boxes. Not all aspects of an ECG rely on precise recordings or having a known scaling of amplitude or time. For example, determining if the tracing is a sinus rhythm only requires feature recognition and matching, and not measurement of amplitudes or times (i.e., the scale of the grids are irrelevant). An example to the contrary, the voltage requirements of left ventricular hypertrophy require knowing the grid scale. In a normal heart, the heart rate is the rate in which the sinoatrial node depolarizes as it is the source of depolarization of the heart. Heart rate, like other vital signs like blood pressure and respiratory rate, change with age. In adults, a normal heart rate is between 60 and 100 bpm (normocardic) where in children it is higher. A heart rate less than normal is called bradycardia (<60 in adults) and higher than normal is tachycardia (>100 in adults). A complication of this is when the atria and ventricles are not in synchrony and the "heart rate" must be specified as atrial or ventricular (e.g., the ventricular rate in ventricular fibrillation is 300–600 bpm, whereas the atrial rate can be normal [60–100] or faster [100–150]). In normal resting hearts, the physiologic rhythm of the heart is normal sinus rhythm (NSR). Normal sinus rhythm produces the prototypical pattern of P wave, QRS complex, and T wave. Generally, deviation from normal sinus rhythm is considered a cardiac arrhythmia. Thus, the first question in interpreting an ECG is whether or not there is a sinus rhythm. A criterion for sinus rhythm is that P waves and QRS complexes appear 1-to-1, thus implying that the P wave causes the QRS complex. Once sinus rhythm is established, or not, the second question is the rate. For a sinus rhythm this is either the rate of P waves or QRS complexes since they are 1-to-1. If the rate is too fast then it is sinus tachycardia and if it is too slow then it is sinus bradycardia. Determination of rate and rhythm is necessary in order to make sense of further interpretation. The heart has several axes, but the most common by far is the axis of the QRS complex (references to "the axis" imply the QRS axis). Each axis can be computationally determined to result in a number representing degrees of deviation from zero, or it can be categorized into a few types. The QRS axis is the general direction of the ventricular depolarization wavefront (or mean electrical vector) in the frontal plane. It is often sufficient to classify the axis as one of three types: normal, left deviated, or right deviated. Population data shows that a normal QRS axis is from −30° to 105°, with 0° being along lead I and positive being inferior and negative being superior (best understood graphically as the hexaxial reference system). Beyond +105° is right axis deviation and beyond −30° is left axis deviation (the third quadrant of −90° to −180° is very rare and is an indeterminate axis). A shortcut for determining if the QRS axis is normal is if the QRS complex is mostly positive in lead I and lead II (or lead I and aVF if +90° is the upper limit of normal). The normal QRS axis is generally down and to the left, following the anatomical orientation of the heart within the chest. An abnormal axis suggests a change in the physical shape and orientation of the heart or a defect in its conduction system that causes the ventricles to depolarize in an abnormal way. The extent of a normal axis can be +90° or 105° depending on the source. All of the waves on an ECG tracing and the intervals between them have a predictable time duration, a range of acceptable amplitudes (voltages), and a typical morphology. Any deviation from the normal tracing is potentially pathological and therefore of clinical significance. For ease of measuring the amplitudes and intervals, an ECG is printed on graph paper at a standard scale: each 1 mm (one small box on the standard ECG paper) represents 40 milliseconds of time on the x-axis, and 0.1 millivolts on the y-axis. J-point The J-point is the point at which the QRS complex finishes and the ST segment begins. The J-point may be elevated as a normal variant. The appearance of a separate J wave or Osborn wave at the J-point is pathognomonic of hypothermia or hypercalcemia. ST segment The ST segment connects the QRS complex and the T wave; it represents the period when the ventricles are depolarized. It is usually isoelectric, but may be depressed or elevated with myocardial infarction or ischemia. ST depression can also be caused by LVH or digoxin. ST elevation can also be caused by pericarditis, Brugada syndrome, or can be a normal variant (J-point elevation). U wave The U wave is hypothesized to be caused by the repolarization of the interventricular septum. It normally has a low amplitude, and even more often is completely absent. If the U wave is very prominent, suspect hypokalemia, hypercalcemia or hyperthyroidism. Ischemia or non-ST elevation myocardial infarctions (non-STEMIs) may manifest as ST depression or inversion of T waves. It may also affect the high frequency band of the QRS. ST elevation myocardial infarctions (STEMIs) have different characteristic ECG findings based on the amount of time elapsed since the MI first occurred. The earliest sign is hyperacute T waves, peaked T waves due to local hyperkalemia in ischemic myocardium. This then progresses over a period of minutes to elevations of the ST segment by at least 1 mm. Over a period of hours, a pathologic Q wave may appear and the T wave will invert. Over a period of days the ST elevation will resolve. Pathologic Q waves generally will remain permanently. The coronary artery that has been occluded can be identified in an STEMI based on the location of ST elevation. The left anterior descending (LAD) artery supplies the anterior wall of the heart, and therefore causes ST elevations in anterior leads (V1 and V2). The LCx supplies the lateral aspect of the heart and therefore causes ST elevations in lateral leads (I, aVL and V6). The right coronary artery (RCA) usually supplies the inferior aspect of the heart, and therefore causes ST elevations in inferior leads (II, III and aVF). 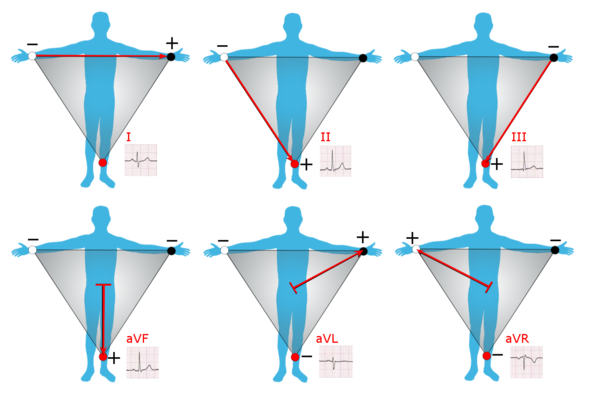 An ECG tracing is affected by patient motion. Some rhythmic motions (such as shivering or tremors) can create the illusion of cardiac arrhythmia. Artifacts are distorted signals caused by a secondary internal or external sources, such as muscle movement or interference from an electrical device. Improper lead placement (for example, reversing two of the limb leads) has been estimated to occur in 0.4% to 4% of all ECG recordings, and has resulted in improper diagnosis and treatment including unnecessary use of thrombolytic therapy. Numerous diagnoses and findings can be made based upon electrocardiography, and many are discussed above. Overall, the diagnoses are made based on the patterns. For example, an "irregularly irregular" QRS complex without P waves is the hallmark of atrial fibrillation; however, other findings can be present as well, such as a bundle branch block that alters the shape of the QRS complexes. ECGs can be interpreted in isolation but should be applied – like all diagnostic tests – in the context of the patient. For example, an observation of peaked T waves is not sufficient to diagnose hyperkalemia; such a diagnosis should be verified by measuring the blood potassium level. Conversely, a discovery of hyperkalemia should be followed by an ECG for manifestations such as peaked T waves, widened QRS complexes, and loss of P waves. The following is an organized list of possible ECG-based diagnoses. The word is derived from the Greek electro, meaning related to electrical activity; kardia, meaning heart; and graph, meaning "to write". In 1872, Alexander Muirhead is reported to have attached wires to the wrist of a patient with fever to obtain an electronic record of their heartbeat. In 1887, Augustus Waller invented an ECG machine consisting of a Lippmann capillary electrometer fixed to a projector. The trace from the heartbeat was projected onto a photographic plate that was itself fixed to a toy train. This allowed a heartbeat to be recorded in real time. In 1895, Willem Einthoven assigned the letters P, Q, R, S, and T to the deflections in the theoretical waveform he created using equations which corrected the actual waveform obtained by the capillary electrometer to compensate for the imprecision of that instrument. Using letters different from A, B, C, and D (the letters used for the capillary electrometer's waveform) facilitated comparison when the uncorrected and corrected lines were drawn on the same graph. Einthoven probably chose the initial letter P to follow the example set by Descartes in geometry. When a more precise waveform was obtained using the string galvanometer, which matched the corrected capillary electrometer waveform, he continued to use the letters P, Q, R, S, and T, and these letters are still in use today. Einthoven also described the electrocardiographic features of a number of cardiovascular disorders. In 1897, the string galvonometer was invented by the French engineer Clément Ader. In 1901, Einthoven, working in Leiden, the Netherlands, used the string galvanometer: the first practical ECG. This device was much more sensitive than both the capillary electrometer Waller used and the string galvanometer. In 1924, Einthoven was awarded the Nobel Prize in Medicine for his pioneering work in developing the ECG. By 1927, General Electric had developed a portable apparatus that could produce electrocardiograms without the use of the string galvanometer. This device instead combined amplifier tubes similar to those used in a radio with an internal lamp and a moving mirror that directed the tracing of the electric pulses onto film. In 1937, Taro Takemi invented a new portable electrocardiograph machine. Though the basic principles of that era are still in use today, many advances in electrocardiography have been made since 1937. Instrumentation has evolved from a cumbersome laboratory apparatus to compact electronic systems that often include computerized interpretation of the electrocardiogram. ^ The version with '-K-', more commonly used in American English than in British English, is an early-20th-century loanword from the German acronym EKG for Elektrokardiogramm (electrocardiogram), which reflects that German physicians were pioneers in the field at the time. Today AMA style and – under its stylistic influence – most American medical publications use ECG instead of EKG. The German term Elektrokardiogramm as well as the English equivalent, electrocardiogram, consist of the New Latin/international scientific vocabulary elements elektro- (cognate electro-) and kardi- (cognate 'cardi-'), the latter from Greek kardia (heart). The '-K-' version is more often retained under circumstances where there may be verbal confusion between ECG and EEG (electroencephalography) due to similar pronunciation. ^ "Merriam-Webster's Collegiate Dictionary". Merriam-Webster. ^ Lilly, Leonard S, ed. (2016). Pathophysiology of Heart Disease: A Collaborative Project of Medical Students and Faculty (sixth ed.). Lippincott Williams & Wilkins. p. 74. ISBN 978-1451192759. ^ Aswini Kumar MD. "ECG- simplified". LifeHugger. Retrieved 11 February 2010. ^ a b Lilly 2016, pp. 80. ^ Braunwald E. (ed) (1997), Heart Disease: A Textbook of Cardiovascular Medicine, Fifth Edition, p. 108, Philadelphia, W.B. Saunders Co.. ISBN 0-7216-5666-8. ^ "What is a STEMI? - ECG Medical Training". ECG Medical Training. 2015-06-24. Retrieved 2018-06-24. ^ "What is NSTEMI? What You NEED to Know • MyHeart". MyHeart. 2015-04-30. Retrieved 2018-06-24. ^ a b Masters, Jo; Bowden, Carole; Martin, Carole (2003). Textbook of veterinary medical nursing. Oxford: Butterworth-Heinemann. p. 244. ISBN 978-0-7506-5171-4. ^ US Preventive Services Task, Force. ; Curry, SJ; Krist, AH; Owens, DK; Barry, MJ; Caughey, AB; Davidson, KW; Doubeni, CA; Epling JW, Jr; Kemper, AR; Kubik, M; Landefeld, CS; Mangione, CM; Silverstein, M; Simon, MA; Tseng, CW; Wong, JB (12 June 2018). "Screening for Cardiovascular Disease Risk With Electrocardiography: US Preventive Services Task Force Recommendation Statement". JAMA. 319 (22): 2308–2314. doi:10.1001/jama.2018.6848. PMID 29896632. ^ Moyer VA (2 October 2012). "Screening for coronary heart disease with electrocardiography: U.S. Preventive Services Task Force recommendation statement". Annals of Internal Medicine. 157 (7): 512–18. doi:10.7326/0003-4819-157-7-201210020-00514. PMID 22847227. ^ "Summary of Medical Standards" (PDF). U.S. Federal Aviation Administration. 2006. Retrieved 27 December 2013. ^ "How we'll invent the future, by Bill Gates". MIT Technology Review. Retrieved 2019-04-01. ^ "FDA approves AliveCor heart monitor". Techcrunch. Retrieved 2018-08-25. ^ "EKG Risks". Stanford Health Care. Retrieved 2019-04-01. ^ Schläpfer, J; Wellens, HJ (2017-08-29). "Computer-Interpreted Electrocardiograms: Benefits and Limitations". Journal of the American College of Cardiology. 70 (9): 1183–1192. doi:10.1016/j.jacc.2017.07.723. Retrieved 2019-04-01. ^ Macfarlane, P.W. ; Coleman (1995). "Resting 12-Lead Electrode" (PDF). Society for Cardiological Science and Technology. Retrieved 21 October 2017. ^ "12-Lead ECG Placement Guide with Illustrations". Cables and Sensors. Retrieved 11 July 2017. ^ Kavuru, Madhav S.; Vesselle, Hubert; Thomas, Cecil W. (1987). Advances in Body Surface Potential Mapping (BSPM) Instrumentation. Pediatric and Fundamental Electrocardiography. Developments in Cardiovascular Medicine. 56. pp. 315–327. doi:10.1007/978-1-4613-2323-5_15. ISBN 978-1-4612-9428-3. ISSN 0166-9842. ^ Sensors, Cables and. "12-Lead ECG Placement Guide with Illustrations | Cables and Sensors". Cables and Sensors. Retrieved 2017-10-21. ^ "Limb Leads – ECG Lead Placement – Normal Function of the Heart – Cardiology Teaching Package – Practice Learning – Division of Nursing – The University of Nottingham". Nottingham.ac.uk. Retrieved 15 August 2009. ^ "Lesson 1: The Standard 12 Lead ECG". Library.med.utah.edu. Archived from the original on 22 March 2009. Retrieved 15 August 2009. ^ Jin, Benjamin E.; Wulff, Heike; Widdicombe, Jonathan H.; Zheng, Jie; Bers, Donald M.; Puglisi, Jose L. (December 2012). "A simple device to illustrate the Einthoven triangle". Advances in Physiology Education. 36 (4): 319–24. doi:10.1152/advan.00029.2012. ISSN 1043-4046. PMC 3776430. PMID 23209014. ^ Meigas, K; Kaik, J; Anier, A (2008). "Device and methods for performing transesophageal stimulation at reduced pacing current threshold". Estonian Journal of Engineering. 57 (2): 154. doi:10.3176/eng.2008.2.05. ^ a b Pehrson, Steen M.; Blomströ-Lundqvist, Carina; Ljungströ, Erik; Blomströ, Per (1994). "Clinical value of transesophageal atrial stimulation and recording in patients with arrhythmia-related symptoms or documented supraventricular tachycardia-correlation to clinical history and invasive studies". Clinical Cardiology. 17 (10): 528–34. doi:10.1002/clc.4960171004. PMID 8001299. ^ Surawicz, Borys; Knillans, Timothy (2008). Chou's electrocardiography in clinical practice : adult and pediatric (6th ed.). Philadelphia, PA: Saunders/Elsevier. p. 12. ISBN 978-1416037743. ^ Otero J, Lenihan DJ (2000). "The "normothermic" Osborn wave induced by severe hypercalcemia". Tex Heart Inst J. 27 (3): 316–17. PMC 101092. PMID 11093425. ^ Houghton, Andrew R; Gray, David (2012). Making Sense of the ECG, Third Edition. Hodder Education. p. 214. ISBN 978-1-4441-6654-5. ^ Alpert JS, Thygesen K, Antman E, Bassand JP (2000). "Myocardial infarction redefined – a consensus document of The Joint European Society of Cardiology/American College of Cardiology Committee for the redefinition of myocardial infarction". J Am Coll Cardiol. 36 (3): 959–69. doi:10.1016/S0735-1097(00)00804-4. PMID 10987628. ^ Segura-Sampedro, Juan José; Parra-López, Loreto; Sampedro-Abascal, Consuelo; Muñoz-Rodríguez, Juan Carlos (2015). "Atrial flutter EKG can be useless without the proper electrophysiological basis". International Journal of Cardiology. 179: 68–69. doi:10.1016/j.ijcard.2014.10.076. PMID 25464416. ^ a b Takla, George; Petre, John H.; Doyle, D John; Horibe, Mayumi; Gopakumaran, Bala (2006). "The Problem of Artifacts in Patient Monitor Data During Surgery: A Clinical and Methodological Review". Anesthesia & Analgesia. 103 (5): 1196–204. doi:10.1213/01.ane.0000247964.47706.5d. PMID 17056954. ^ Kligfield, Paul; Gettes, Leonard S.; Bailey, James J.; Childers, Rory; Deal, Barbara J.; Hancock, E. William; van Herpen, Gerard; Kors, Jan A.; Macfarlane, Peter (2007-03-13). "Recommendations for the standardization and interpretation of the electrocardiogram: part I: The electrocardiogram and its technology: a scientific statement from the American Heart Association Electrocardiography and Arrhythmias Committee, Council on Clinical Cardiology; the American College of Cardiology Foundation; and the Heart Rhythm Society: endorsed by the International Society for Computerized Electrocardiology". Circulation. 115 (10): 1306–24. doi:10.1161/CIRCULATIONAHA.106.180200. PMID 17322457. ^ "Minimizing ECG Artifact" (PDF). Physio-Control. Physio-Control, Inc., Redmond WA. 2015. Retrieved 21 October 2017. ^ Jafary, Fahim H (2007). "The "incidental" episode of ventricular fibrillation: A case report". Journal of Medical Case Reports. 1: 72. doi:10.1186/1752-1947-1-72. PMC 2000884. PMID 17760955. ^ Mangalmurti, Sandeep; Seabury, Seth A.; Chandra, Amitabh; Lakdawalla, Darius; Oetgen, William J.; Jena, Anupam B. (2014). "Medical professional liability risk among US cardiologists". American Heart Journal. 167 (5): 690–96. doi:10.1016/j.ahj.2014.02.007. PMC 4153384. PMID 24766979. ^ Chanarin, N., Caplin, J., & Peacock, A. (1990). "Pseudo reinfarction": a consequence of electrocardiogram lead transposition following myocardial infarction. Clinical Cardiology, 13(9), 668–69. ^ de Winter, Robert (6 Nov 2008). "A New ECG Sign of Proximal LAD Occlusion". NEJM. 359 (19): 2071–3. doi:10.1056/NEJMc0804737. PMID 18987380. ^ Waller AD (1887). "A demonstration on man of electromotive changes accompanying the heart's beat". J Physiol. 8 (5): 229–34. doi:10.1113/jphysiol.1887.sp000257. PMC 1485094. PMID 16991463. ^ a b c Hurst JW (3 November 1998). "Naming of the Waves in the ECG, With a Brief Account of Their Genesis". Circulation. 98 (18): 1937–42. doi:10.1161/01.CIR.98.18.1937. PMID 9799216. ^ Interwoven W (1901). "Un nouveau galvanometre". Arch Neerl Sc Ex Nat. 6: 625. ^ Rivera-Ruiz M, Cajavilca C, Varon J (29 September 1927). "Einthoven's String Galvanometer: The First Electrocardiograph". Texas Heart Institute Journal / from the Texas Heart Institute of St. Luke's Episcopal Hospital, Texas Children's Hospital. 35 (2): 174–78. PMC 2435435. PMID 18612490. ^ Cooper JK (1986). "Electrocardiography 100 years ago. Origins, pioneers, and contributors". N Engl J Med. 315 (7): 461–64. doi:10.1056/NEJM198608143150721. PMID 3526152. ^ "Dr. Taro Takemi". Takemi Program in International Health. 2012-08-27. Retrieved 2017-10-21. ^ Mark, Jonathan B. (1998). Atlas of cardiovascular monitoring. New York: Churchill Livingstone. ISBN 978-0-443-08891-9. Wikimedia Commons has media related to ECG.